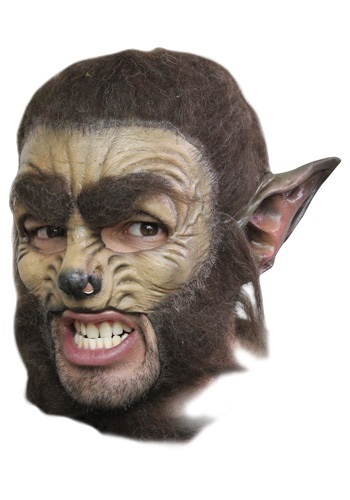 This Gray Lycan Werewolf Mask will give a totally realistic look. 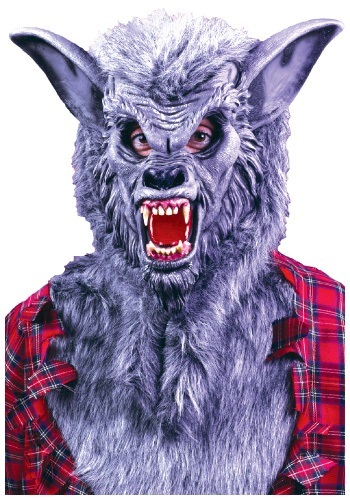 It's great as part of any wolf or werewolf costume. Take your scary costume to the next level! 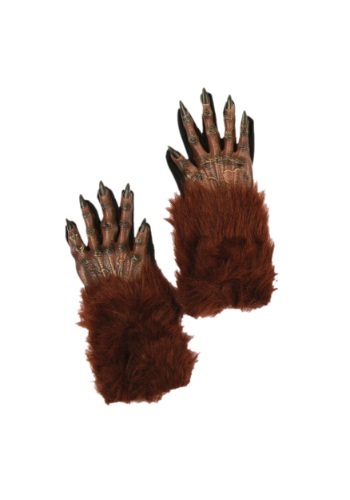 Wear it alone or as the finishing touch to any wolf or werewolf costume. When the moon is full the wolves come out and play and no other wolf out there knows how to monster mash more than the werewolf. This creature of the night always love howl at the moon and run through the woods. 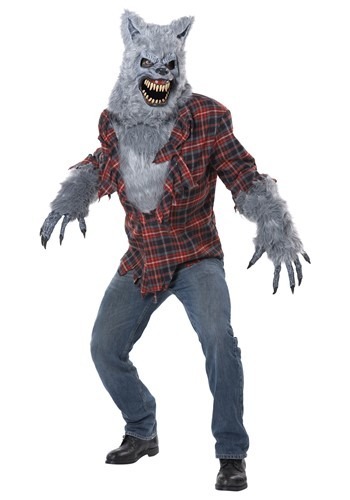 Now you can become a classic monster with out that whole getting bit by a werewolf thing with this great costume. You didn't know wolves or werewolves could be white? Of course they can, if they live in snowy climates. So any arctic werewolf will want this White Lycan Werewolf Mask. The better you blend into your surroundings, the easier time you'll have catching your prey. When someone is bit by a werewolf on the next full moon they'll go through some changes. Those changes being an increase in hair, long sharp teeth, and wolf ears. Because once someone is bit by a werewolf they too will become one as well. 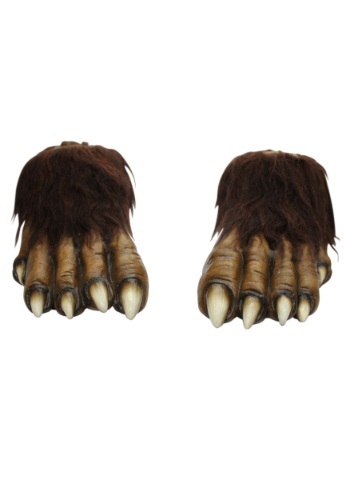 Now you can go through your own transformation with the help of these great wolf feet. We totally get it, werewolves are awesome! They pretty much have it all. They exude intimidation while they howl at full moons plus they are pretty soft and furry when they aren't all mangled up...so they're great at cuddling. 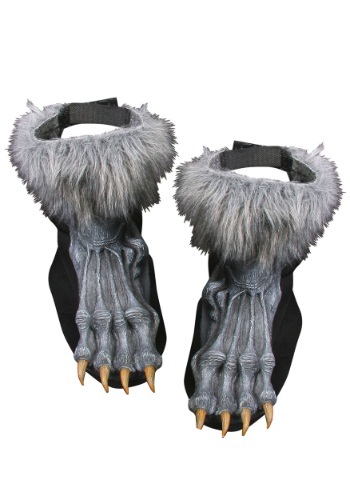 Impress the ladies with your manly werewolf fur and your moon howling technique when you wear these Black Werewolf Gloves. Be the fiercest wolf or werewolf in the forest with this Blood Moon Ani-Motion Mask! As you move your jaw, the mask's mouth opens and closes for a very realistic look. Your hands...they're so very human. Doesn't that bug you? You could be living it up like a hideous beast of the night, if it weren't for those pretty hands of yours. We've come up with a solution. 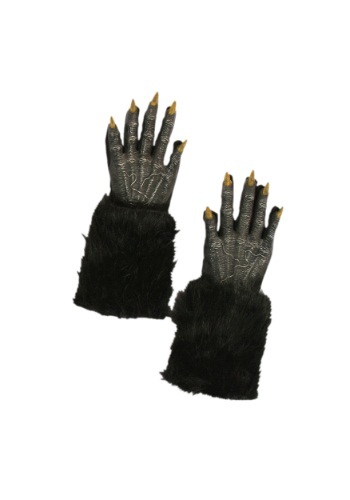 These werewolf gloves give your hands the piece of mind they've been looking for. You can also scare small children with them, or confuse your dog! It's great fun for anyone with a desire to look like someone afflicted with lycanthropy. When the moon is full you'd better keep an eye out when you walk around the moors. That is where the werewolves go out to play, and if you're not careful enough you may come in contact with them. If you do, you'd better have your running shoes on--because these guys don't play around. Now your child can dress up as one of these lycanthropes with this Child Black Werewolf Costume! A surprising, little known fact is that lycanthropy affects people living above the 45th parallel at almost a two to one rate. We're not sure if it's the cold weather or the rugged terrain of the north woods, but either way you have double the chance of becoming or encountering a werewolf in these areas. 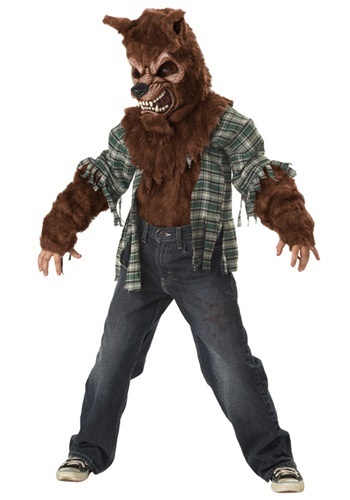 If you want to protect your child from werewolves, get him this costume. Because werewolves never bother other werewolves! This werewolf may have a belly...but he's still hungry and it's a full move so...you better run. 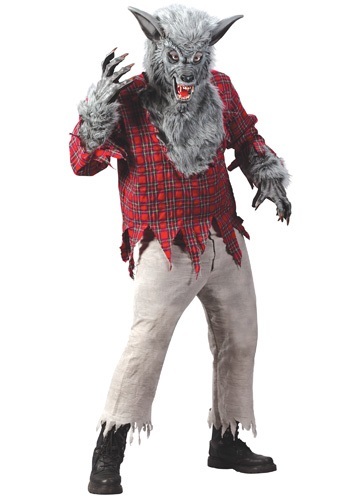 Transform at the next full moon once you put on this Gray Plus Size Werewolf Costume. This is a complete costume that even comes with the long furry gloves. Human hands are okay and all. They get the job done, whatever it may be. But do you ever find yourself fantasizing about what it would be like to have hair all over your hands? 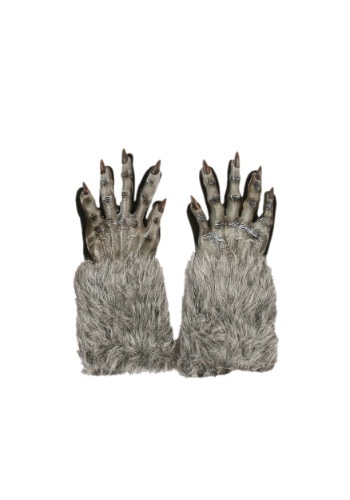 If so, these Grey Werewolf Gloves could really fulfill all of your fantasies. If you're a fan of Hemlock Grove, you know that transforming into a werewolf isn't exactly a... pleasurable experience. Peter Rumancek knows that it can be downright painful! This mask captures the transformation just as the snout appears so you can look just like Peter. And the best thing about this mask? You don't have to deal with any of the muss and fuss associated with the transformation. Of course, you will be known as a werewolf henceforth from wearing it, but that's an all right trade-off. Don't be surprised if this guy gets extra hairy and starts eating everything in the refrigerator once the moon is full. It happens about once a month, but his parents have everything under control. 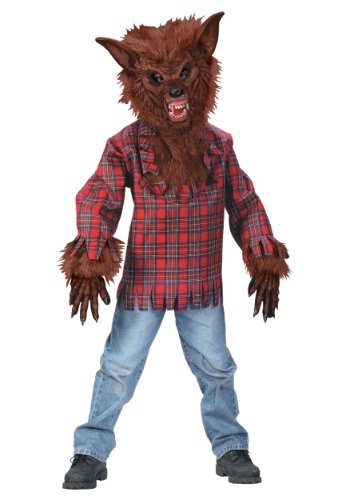 Wear this Kids Fierce Werewolf Costume to scare the parentals. They will also be surprised at how much hair you've sprouted in such a short time! He doesn't need a full moon to transform into a wild, unhinged, unearthly creature. All he needs is a Kids Howling at the Moon Costume and one awesome growl. Why risk the pain of transformation, memory loss, and waking up in strange places post episode? Slip into this realistic costume and spend the night terrorizing others aux natural...that is a human posing as a creature! Look who is howling at the moon right after he ate Little Red Riding Hood. 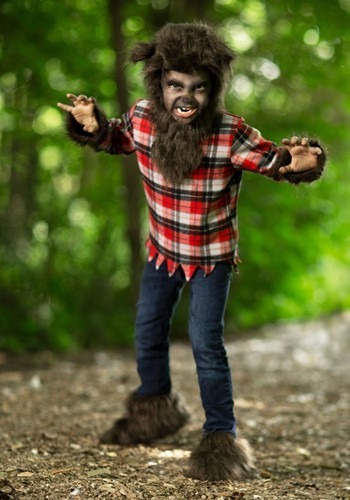 Your little one will love to wear this Kids Werewolf Costume. This is a scary costume choice for little kids. 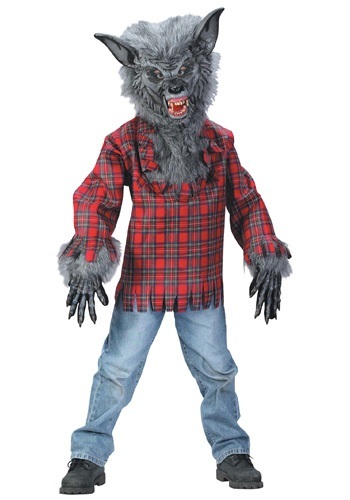 Add this costume to a Little Red Riding group costume for a scary affect! She's ready to howl at the moon! She just got done chowing down on Little Red Riding Hood now she's looking for a granny to feast upon. So, is your grandma home? Hide out in the woods behind some shrubs just waiting for your next tasty victim. You're bound to run across someone scrumptious eventually! Have you seen Little Red Riding Hood lately? This wolf has and he's eaten her already! Nom nom nom! 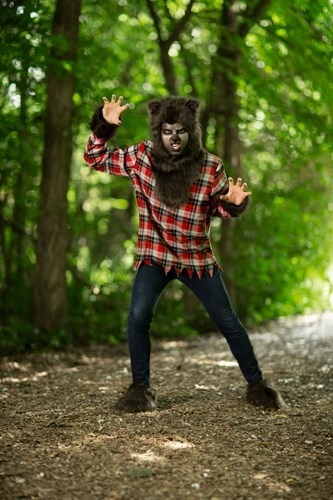 This Silver Werewolf Costume will transform you into a furry and ferocious werewolf without the full moon. Pair this costume with a Red Riding Hood costume for a scary and unique couples' costume idea. Want to know a secret about werewolves? The transformation into a wild beast always starts with the feet. The skin becomes leathery and giant claws burst out of the feet. Fur starts shooting out of the ankles. That's how you know the inner wolf is coming out. That's why if you see anyone with feet that look like these shoe covers, you'd better run, or you'll become lunch for a monster! 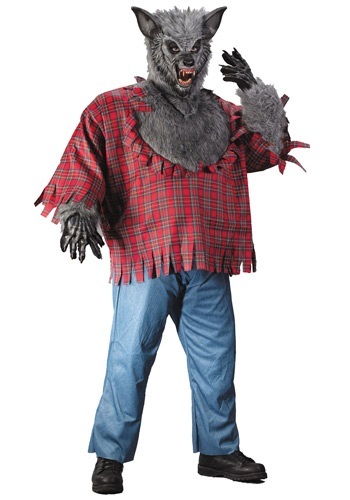 Get ready to have a howling good time when you wear this Teen Full Moon Sassy Werewolf Costume for Halloween! Add our wolf bag, and check out our other werewolf costumes for your friends. You can form your own wolf pack! 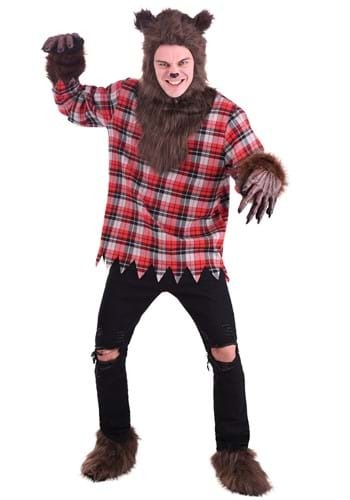 Wear this scary Teen Wolf Costume with your own tattered jeans, and just hope that there's not a full moon on Halloween night! You'll scare the daylights out of everyone at your party. Did you know that one of the remedies for curing a werewolf was to subject the victim to long periods of physical activity? The idea was that this would leave them feeling weak and purge the wolf out of the body. Thankfully, those times have pasted, and we now live in a more wolf-friendly environment. 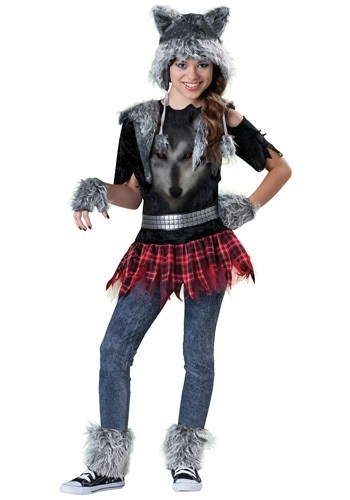 She'll be everyone's favorite part-wolf in this cute Tween Howlette Costume. Every tween starts staying up later and meeting new friends, but we were more than surprised to see ... this new transformation. Easy, easy! I've got a steak in the fridge that you can have. Just please, don't eat me. That lousy full moon has been getting your way for years, but no more! No longer do you have to wait for it to transform into a werewolf! No more do you have to wait for it to indulge in your beastly inner desires! 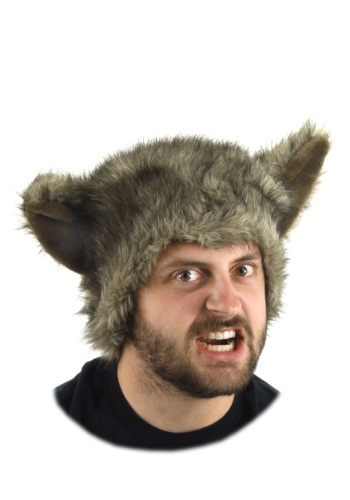 All you have to do is put on a werewolf hat and your transformation will become complete. Does a full moon tend to bring out your inner beast? 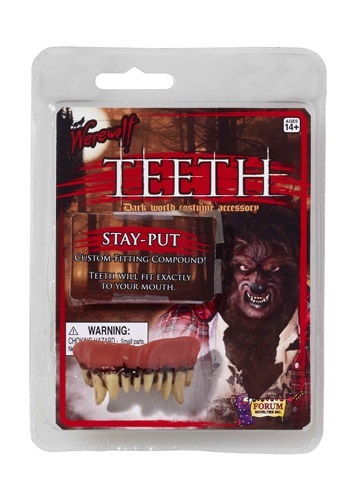 If not, no need to worry because you can use this werewolf makeup kit to complete your transformation instead. 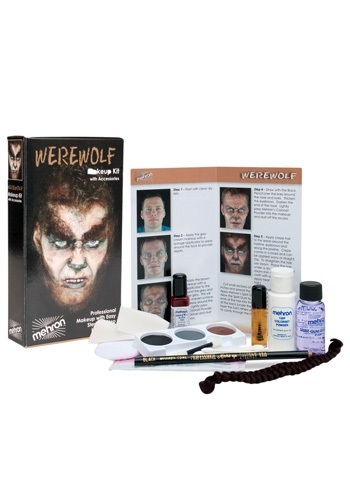 The kit includes everything you need to achieve a realistic look to complete your werewolf costume! You howled for them and they came, a pair of custom fit Werewolf Teeth. Transforming into a vicious night creature is painful, we get it. Bones cracking, skin stretching, one thing transforming into another. These teeth are just another way we can make the transformation easier!